"Somewhere, Someone - This Is Your Life"
What other THAMES series of plays could possibly deal with an exhumed Egyptian Queen with a dismembered hand; a schizophrenic demon barber, who specialises in cutting client’s throats so that their corpses can be used to make veal pies; an eccentric Prince, who, bored to distraction, assumes a disguise and joins a Suicide Club where a member is killed every Friday and then disposed of by a body-snatcher – but ‘Mystery and Imagination’, which returns to the screen in colour during January of next year? This feature is about ‘Curse of the Mummy’ – about the people who produced it and the work entailed by each department. 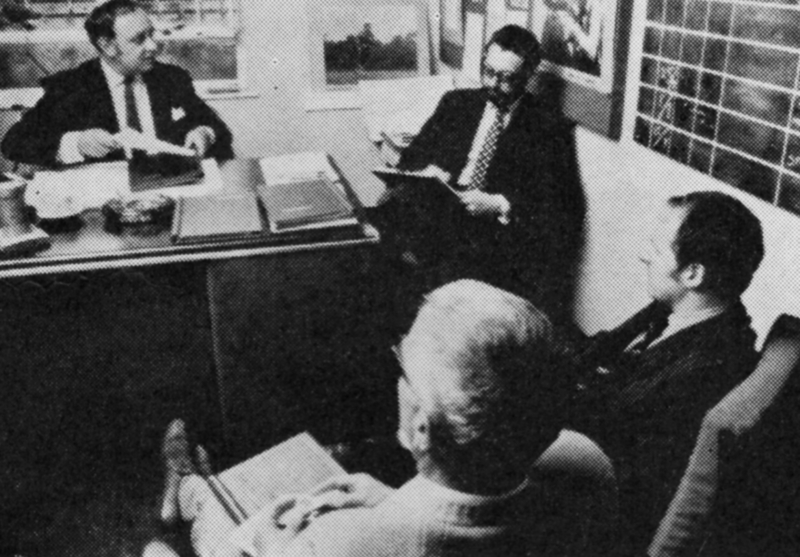 Reginald Collin holds the first planning meeting. The Producer of this particular series of ‘Mystery and Imagination’ is Reginald Collin. He is the man who has overall responsibility for the entire series. At the start of a production, the Producer discusses the play with the Director and then remains available from the outset for consultation on all matters from interpretation to budgets and casting. It is the Producer who has the last word on any decision and it is the Producer who carries the can if any of these decisions prove to be misguided. When the Director has done his job and the play is ready to be recorded, the Producer sits in the Control Box and, with the Story Editor, makes notes for the benefit of the Director, who is usually pleased at this stage to have comments from another practical television man on aspects of the production he may have missed. Reginald Collin is very pleased with this particular combination of plays for ‘Mystery and Imagination’. ‘Curse of the Mummy’, ‘Sweeney Todd’, which he directed as well as produced and ‘The Suicide Club’, apart from being exceptionally well written, all have the same basic underlying theme in that they concern people who turn out to be not quite what they seem to be. This gives the series as a wholesome kind of unity. 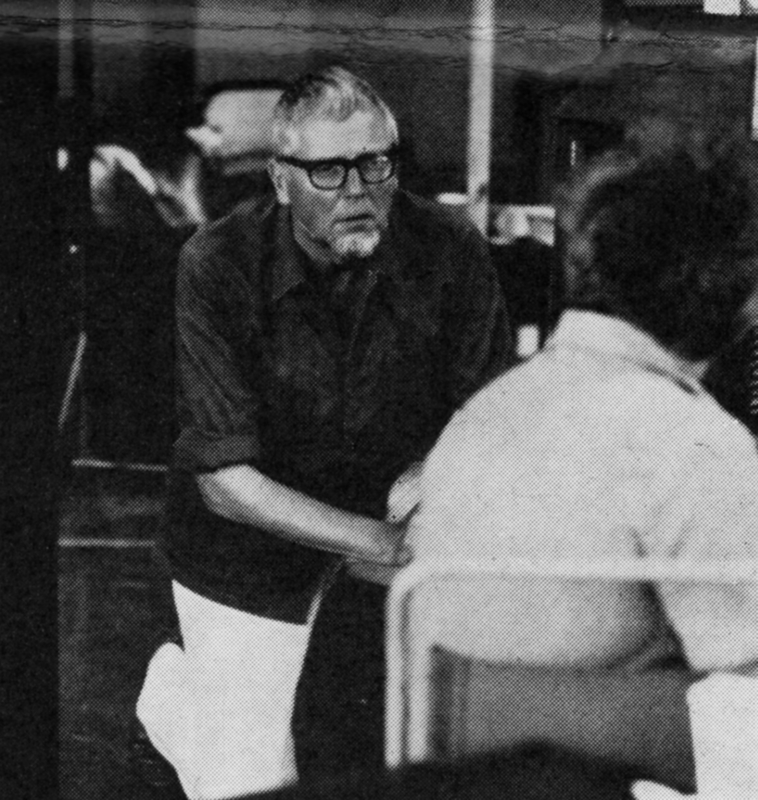 Guy Verney directing Donald Churchill. Before describing the function of a Director – in this case Guy Verney, it may be useful to explain the difference between a Director and a Producer. The Producer is the man in charge of the programme and the Director is the man, who, under the Producer’s supervision, controls the cameras and the people taking part, i.e. selects the camera shots, the positioning of the actors, their interpretation of the script and the special effects necessary. Special effects were an important and difficult feature of ‘Curse of the Mummy’. For example, there were scenes where no specific activity was taking place but the illusion had to be created that an evil, eerie kind of atmosphere was pervading a room. The difficulty lay in the fact that there was no tangible way of suggesting this. Finally, after consultation with the Designer, they hit on the solution of photographing, slightly out of focus, some tightly crumpled cellophane. This was then recorded on video tape, played back and gently superimposed over the scene. The result was a silver-mottled effect that kept appearing and disappearing. This evil atmosphere was supposed to emanate from a mummified cat. To convey this, a special model of the cat was made through which smoke could be piped. Using the vision mixer, a green effect was superimposed over the smoke, which helped to intensify the suggestion of something evil entering the room. The essence of a well directed play is good teamwork. Casting, design, technical people must all work well together as a team. Once that relationship has been established any production is guaranteed success. When a Producer has chosen a theme, the Story Editor must find a play to convey it. ‘Curse of the Mummy’, which is based on Bram Stoker’s story, ‘Jewel of the Seven Stars’, was Brian Brooke’s responsibility. I spend a lot of my time saying “No” to writers, practising or would-be. Occasionally I allow myself a cautious “Maybe… – the jubilant “Yes!”, and the jubilation is heart-felt, believe me, is an historic rarity. I can’t, however, recall many occasions when my response has been a genuinely puzzled “Eh…?” But puzzled “Eh…?” it was, when John Russell Taylor suggested ‘Jewel of the Seven Stars’ as a follow-up to his highly successful dramatization of Bram Stoker’s ‘Dracula’. ‘Jewel’ is the most neglected product of Stoker’s teaming imagination (if one excludes his first work in a rather different vein ‘The Duties of Clerks of Petty Sessions in Ireland’) I’d never even heard of it, to my lasting shame. I read it, all 250 microscopically printed pages of it, and, amid a welter of plot and counter-plot involving an army of characters, numerous exotic locations, flash-backs historical and otherwise, dream sequences, etc., began to see what John was driving at. So the writer – story editor creative process began i.e. we spent a lot of time shouting at each other. When the smoke of creative battle cleared the next step was obvious. John retired, regrouped and reappeared clutching a synopsis. A critic by profession, his great advantage, where a story editor is concerned, is his sense of dramatic structure. His synopsis was a near miracle of time-scale reduction, plot-pointing. location elimination and character amalgamation. Wisely he had followed some, if not all, of my advice – or so I shall continue to insist in the teeth of all opposition. Then came The Lull; a period only too familiar to every story editor: the first draft was awaiting… Resisting, as Mr Stoker would say, “with every fibre of my being” almost hourly temptations to phone him in his Welsh retreat on the most trivial of pretexts to remind him of “this” or suggest “that”, I waited. Patience, faith, fortitude, all were rewarded. Our final rehearsal script scarcely differed at all from John’s first draft. We – and I know I speak for Reg Collin, Producer, and Guy Verney, Director, as well as myself – were delighted. I hope you and our viewers will share our enthusiasm. 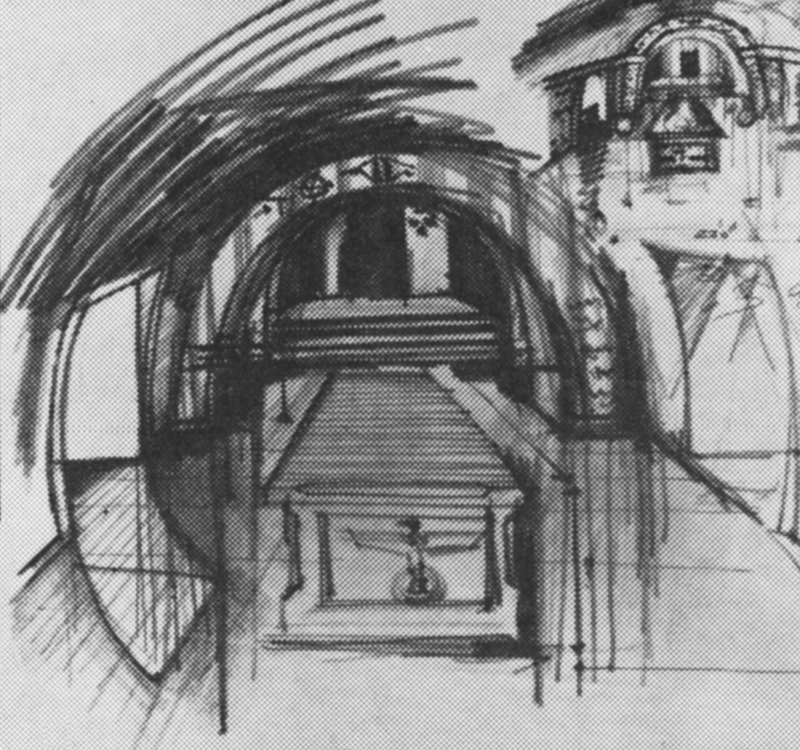 Mike Hall’s preliminary sketch for the Tomb. Mike Hall explains some of the problems of designing for Television melodrama. 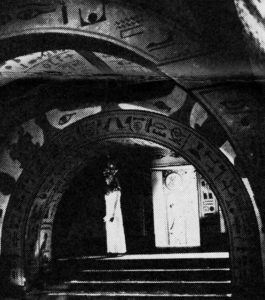 Isobel Black as ‘Queen Tera’ stands in the entrance to the huge set of the Mummy’s Tomb. ‘2001’, a masterpiece of illusion and cinematic art, had the problem, amongst many, of building a two-hundred foot high revolving Hilton. “Surely this was an illusion – photographic tricks”, you say. Not so – they built a two-hundred foot high revolving Hilton. Melodrama on Television has to face up to these problems. The public must surely have rumbled now, the commonplace dodge of shooting it tight or using back-projection. If one elects to do a melodrama for Television, then the gigantic wide shot i.e. 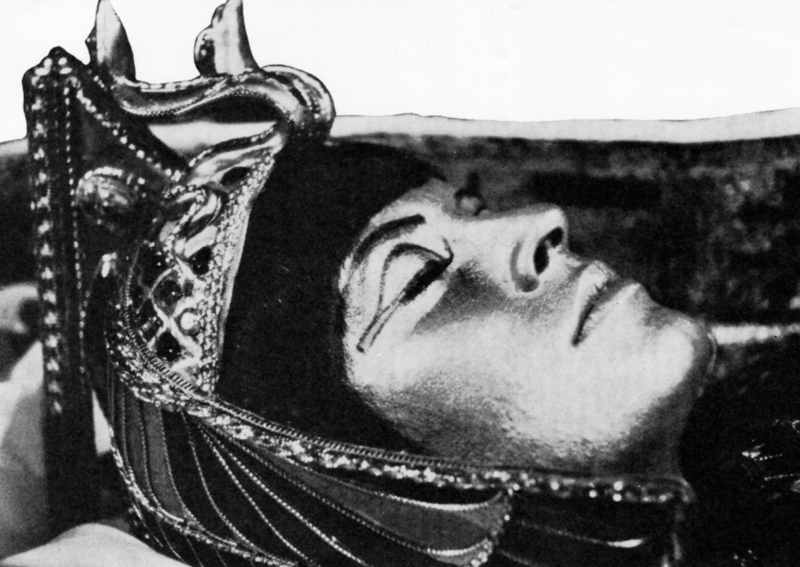 the Mummy’s Tomb, cannot be achieved by trickery. The tomb has to be built for real as the importance of the large dramatic shot is one of the underlying visuals in a melodramatic piece. The shot of Frankenstein standing on top of the mountain, Silas sitting in his large drawing-room, Dracula appearing in the church – are all visuals that cannot be shortcut. The sets for these sort of shots must be real, dramatic and overpowering. This is the demand, basically, for a Set Designer working with melodrama. His greatest challenger is the horror feature film and he has to create designs for Television that will not look like a poor man’s version, despite the fact he is working with a much smaller budget. If we are to compete with the horror feature film, huge sets are essential. 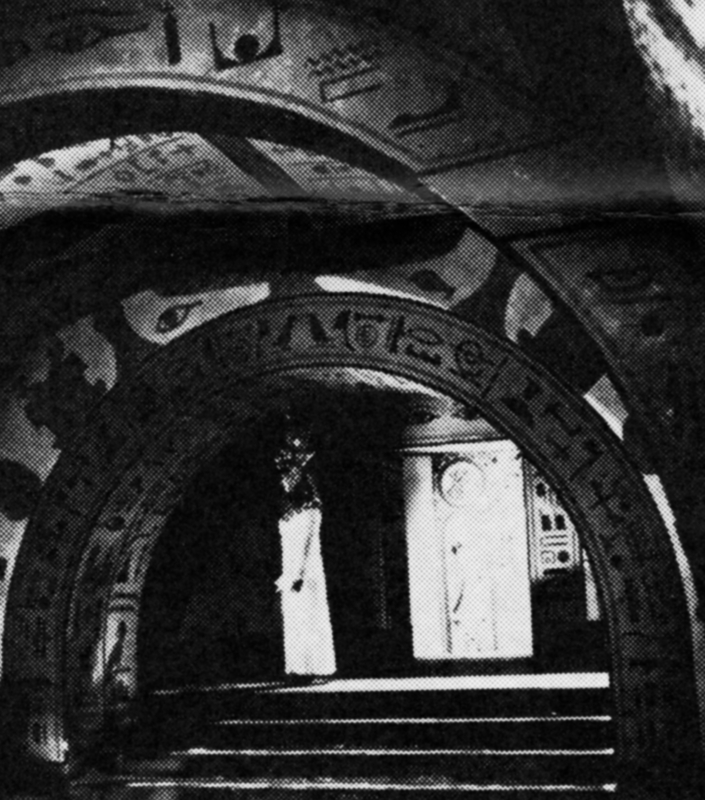 The huge set for the Mummy’s Tomb produces all the required effects. It looks both dramatic and authentic. The authenticity was acquired by studying colour photographs in magazines, purchasing books and articles on Egyptology and consulting an authority at the British Museum about weapons, lamps and other objects that were typical of the period. Isobel Black wearing the elaborate head-dress designed by Jill Silverside. All the costumes for ‘Curse of the Mummy’ were designed by Jill Silverside. 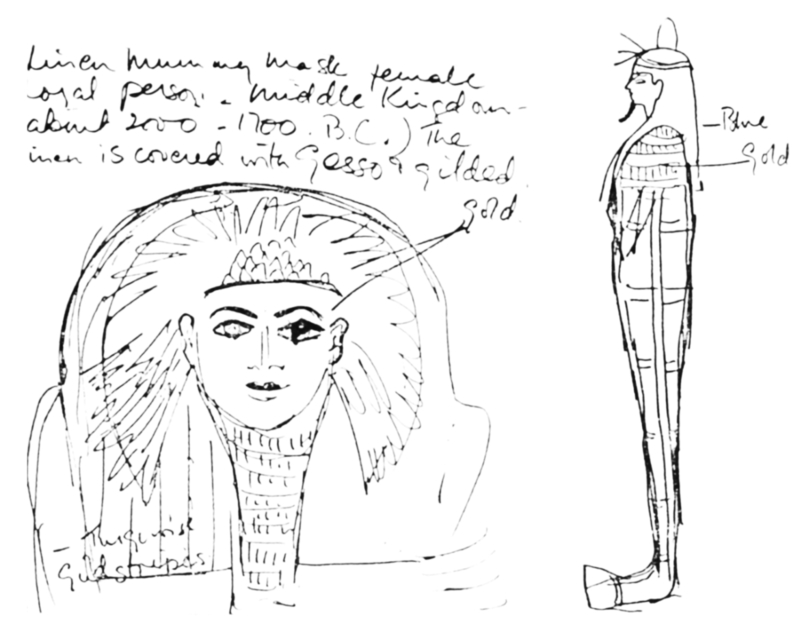 Jill Silverside’s preliminary drawings for the designs of the Egyptian costumes. One of the most interesting designs is the rather spectacular and elaborate Headdress worn by Queen Tera. This evolved from visits Jill made to the British Museum and research from various books on Egyptology. The design had to combine the symbols for both Upper and Lower Egypt and, of course, be wearable in both a standing and prone position, which entailed having the head-dress and collar made in sections. To cut down on bandaging time for the mummy, Jill decided to make a cast of Isobel Black’s figure. She was enclosed in a tube of mutton cloth and then brown sticky-tape was used to build up the cast. The back was cut away so that Isobel could get out and, after trimming, this shape was used to support the wrappings. An incidental advantage, apart from speeding up the dressing, was that it also eliminated all signs of breathing. All the Egyptian costumes were made in Wardrobe by Jill. Several of these had to be transparent. After testing many materials for transparency in front of the colour cameras, Jill decided that the one which produced the nearest effect to the original and was most acceptable to the cameras, was pure silk chiffon, which had to be sunray pleated. It is easy to see, by the original designs illustrating this page, that Jill’s costumes look authentic, dramatic and add as much credibility to the theme of the play as the performance of the actors who wear them. If a Drama PA was photographed in a setting that adequately conveyed the nature of her work, she would probably be seen surrounded by a huge mound of lists, schedules, memos, scripts, tranquilisers and overworked typewriters. RELATED "Somewhere, Someone - This Is Your Life"
From the start of rehearsals for ‘Curse of the Mummy’ through to camera-script stage, Betty Kenworthy’s job was mainly one of liaison i.e. making sure that everything murmured at odd moments by the Director, finally reached the people who needed to know about it. During the rehearsal week, Betty talked to the Graphic Artist about the style of lettering to be used, ordered captions and other graphic work; passed on to Props the Designers’ Prop List plus the Stage Manager’s additional props; ordered all practical water, gas or electrical requirements; ordered technical requirements i.e. cameras, microphones and extra lights; arranged dressing rooms for artistes; kept Wardrobe and Make-up closely informed of any changes or new ideas; booked recording and dubbing sessions; ordered effects and music and re-typed altered pages of script, changed at rehearsals. Once in the Control Room, during camera rehearsal, the P.A. follows the blocking of shots – confirming over the microphone, the camera and shot number; times the production; rolls in film or VTR inserts and generally tries to keep ahead of the Director’s needs. When the play is recorded, payment of artistes must be organised; lists compiled of all music, film, photographs or anything else used and a coherent editing script made up for editing and dubbing sessions. After timing the final edited version of the play, all the relevant information is sent to Transmission Control and the P.A. must start from the beginning The First Rehearsal, again on the next script! One such man is Keith Andrews, who was Casting Director for ‘Curse of the Mummy’. A Casting Director is involved very much at the beginning of any production, when ideas are exchanged with the Producer and the Director about which actors seem right for the various roles. As soon as a list of suggestions is compiled, the Casting Director rings the agents of the actors concerned to check their availability. If the first name on the list is not available, the second name on the list is tried and eventually a complete cast is assembled. Apart from the ‘rightness’ of a particular actor for the part, choice is largely governed by budget and the availability of the people selected. 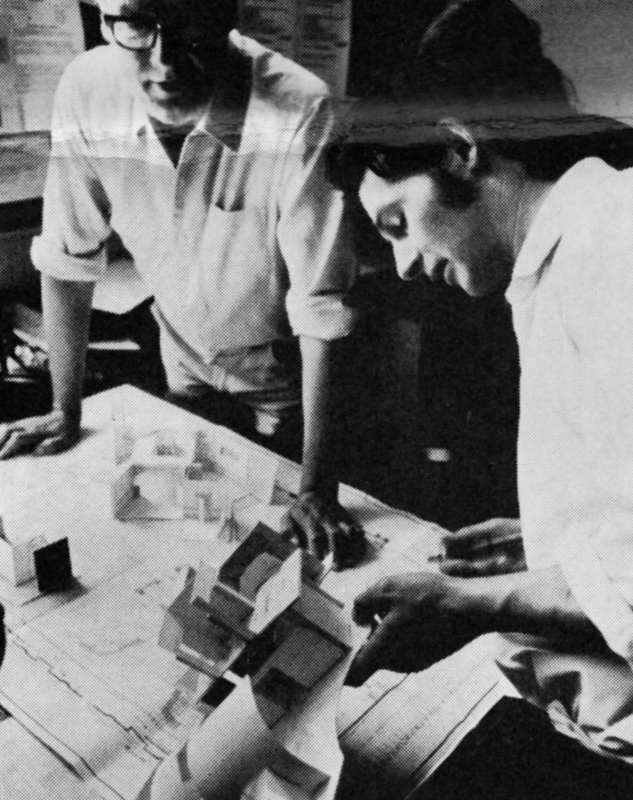 From a casting point of view, ‘Mystery and Imagination’ is a particularly fascinating series. The cast have to play extremely intriguing characters in great depth. Faces are very important if the actor is to convey the sinister quality of the plays convincingly. 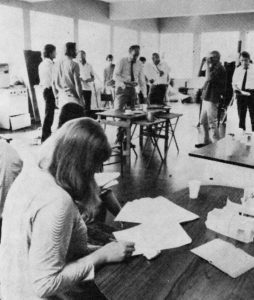 Even the extras, who are normally supplied by reliable agencies, must be chosen carefully. A scene set in an inn, for example, which requires a dozen extras, can only have the right atmosphere conveyed if the agency produces people of the right age, with the required physical characteristics. A batch of serene, genteel ladies, who look like left-overs from a vicar’s tea-party, are unlikely to evoke the same impression of debauched revelry as effectively, say, as a group of broken-nosed ruffians of the type Hogarth could have painted. Casting ‘Curse of the Mummy’ was relatively simple as we were lucky enough to get all the actors we specifically wanted. 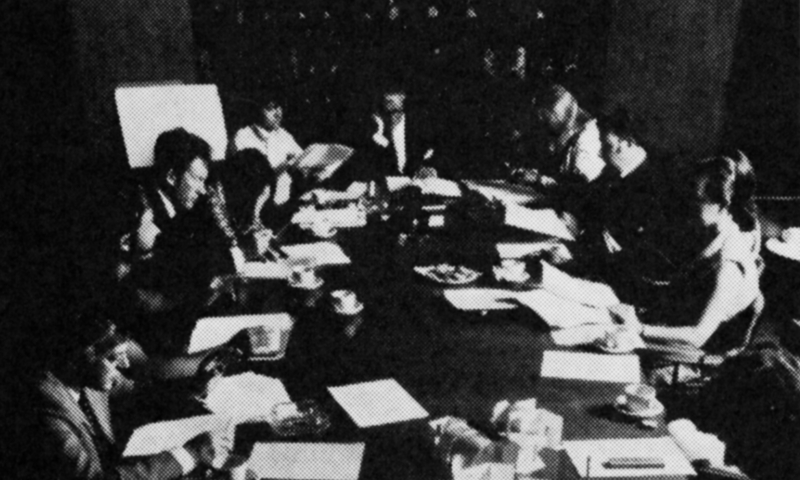 There were no awkward parts to cast, as in ‘The Suicide Club’, which requires “a hunched-back dwarf, who plays the violin”. Choosing Isobel Black to play Queen Tera was Guy Verney’s idea and the decision was unanimously approved. She read the script, liked it and agreed to play the role. When you eventually see the play and observe the faces of the actors it should be easy to see why each one was an ideal choice for each part. In such a limited space it is impossible to cover every aspect of a production and several areas of work have not been mentioned. The technical side of the play was the responsibility of Peter Howell, Cameras; Andy Andrews, Lighting; Ron Ferris, Sound and Del Randell, Technical Supervisor. Carol Bright supervised Make-up, the Floor Manager was Denver Thornton and the Stage Manager, Betty Crowe.